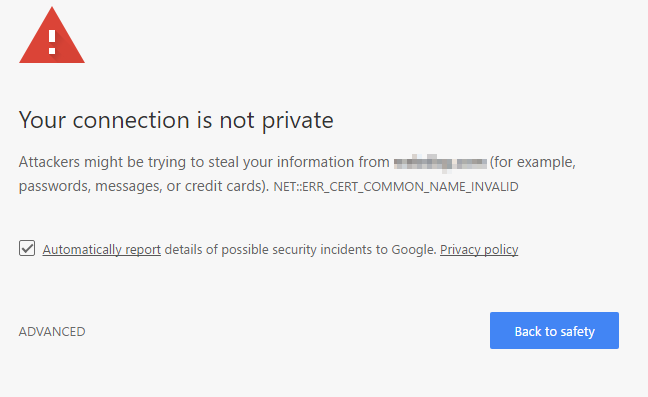 With the release of Chrome 62 any site that you visit with any form of user input which does not have a valid SSL certificate will add a note to the address bar saying "Not secure". This is a step towards secure by default but not everybody is keen for this to happen. Fortunately there are tools out there to save us. OpenSSL is an open source, robust and full-featured toolkit for the Transport Layer Security (TLS) and Secure Sockets Layer (SSL) protocols. With it we can generate certificates that satisfy the needs of modern browsers. To begin with we will put together a config file with the fields we want in our certificate. This should be in INI format. The alt_names section should have all of the URL's that you want the certificate to apply to and include any IP's that you want the certificate to cover. With a configuration prepared we next need to request a certificate to use as a local authority and use that to generate a usable certificate. We have now generated a PKCS12 (PFX) certificate which IIS can understand. To make it easier to get that certificate into IIS we can use certutil to import it into the user and local storage. This certificate acts as both a valid SSL certificate in IIS and also as it's own authority. certutil -f -user -p YOURPASSWORD -enterprise -importpfx root "OUTFILE.pfx"
certutil -p YOURPASSWORD -importpfx "OUTFILE.pfx"
Configure your site to use your certificate via the bindings option in the IIS snap in. This is enough for Chrome to give you a green "Secure" padlock. For Firefox we need to add an exception for our site as it is self signed and then we will get the green "Secure" padlock.